When in the glimmering between two years it is tradition predict the “near” future. 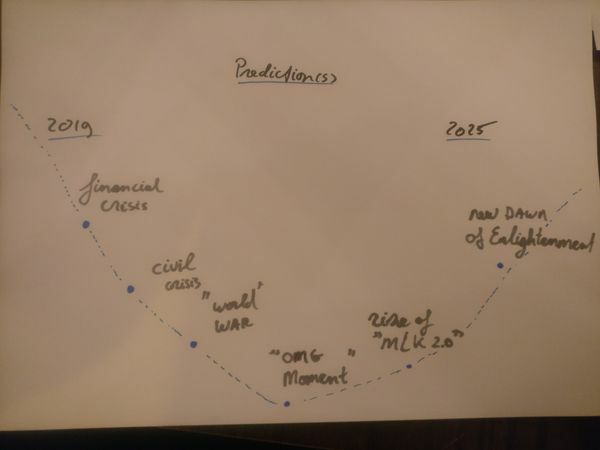 Since predicting only one year ahead is a bit boring, I am going to start with my yearly 5(+)-years prediction. My predictions will not be of the type “2019 will be the year of AI and Ethics” or “2019 will be the year of autonomous cars”. 2019 will be the year of a Mondial financial crisis larger than the 2008 financial crisis. 2020 will be the year of the financial crisis combined with big social unrest aka in the US and EU forced the resignation of leaders of government. 2021 will be the year of financial, civil crisis and the start of World War 3. 2023 will be the year of the start of the new and global enlightenment. Here are some thoughts on how to work with these predictions from the point of view of an IT company. Hire technically skilled people and make sure the ecosystem is focused on controlling technology. Don’t use rational sales and (IT) implementation techniques since the era of facts and logical reasoning is over. Combine (1, tech is all) and (2, logical reasoning is gone) in your company culture. Focus on being the best IT-craftsman and know that this is a very small niche and you need more to be able to implement the craft at companies. Be agile and verify since nobody can predict how a crisis is evolving, be creative and bold. Protect your people while doing this. Invest in psychologists, philosophers, and people that can improve the wellbeing of your people. A financial crisis, civil crisis, and war will bring enormous psychological stress to people. Being the one company that keeps its cool will create room for making a big impact. Knowing which waves are coming upon us, gives us the opportunity to keep calm and keep zen. 2019 will see a financial crisis that dwarves the 2008 crisis. The pattern of high/low markets are usually 7 years apart (Wikipedia, usfunds, usfunds, Twitter, The Guardian, CNBC, The Cconomist ). 2018 is a high (bear) market (Wikipedia). we see that financials are selling all their assets (housing, stock) in Q4 of 2018 due to the fact it is the end of the year, but also since it should be the end of the bear market. Of course, trends are not that great of an indicator. The Brexit is imminent in 2019. If there is a hard Brexit (so article 50 is effective without a new agreement between EU and UK) then the UK will go bust (no food, no medicine, no workers) and the EU will lose a lot of revenue and needs to re-route many of its supply-chains (suppliers and buyers). Finding the new balance in EU and the down-go of the UK will create a financial crisis. When there is a soft-Brexit then civil unrest will come and potential a smaller movement to find a new balance. When there will be an “undo” of the article 50 then the UK will have a civil uprising that will spread to the other EU countries, igniting the fuel behind the national populism and movements like #gilets jaunes. Either way, things will get interesting. Tradewar: The US is with Trump as president a large economical power that is unpredictable in its movement. Many trade deals, trade tariffs, and even military actions are unstable and unpredictable. The financial market tends not to like this unpredictability. Some canaries in the coal mine are warning for the upcoming big crash. Like Nassim Nicholas Taleb stating in a Bloomberg interview “The World Is More Fragile Today Than in 2007“. Or Willem Middelkoop with his timeline. In 2020 the financial crisis will evolve into global civil unrest. 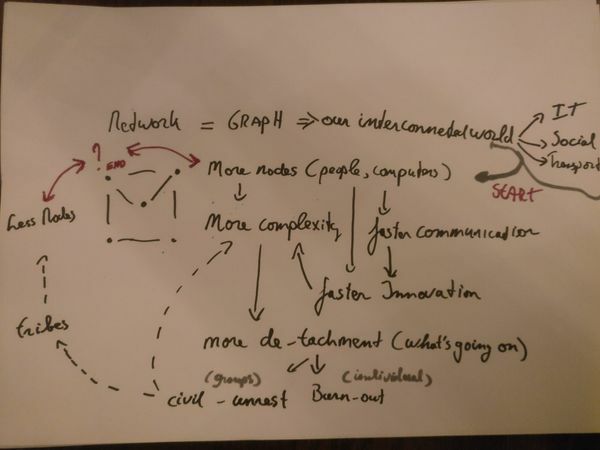 Where the current society is developing more and more from a hierarchical and dialogue based society to a network society. We as a people are connected everywhere via technology, social media, and ease of transportation. The predicted global village is now a reality. This is the reason we as a people do not trust the “elite” anymore since we can Google everything, or are in a bubble with our tribe that sees the world differently. The fast-moving world in terms of information and innovation widens the gap between the people that can process these transformations and the people that can’t. To counter this detachment people are looking for identity by selecting a common foe and/or by selecting a tribe that provides an identity. This longing for a tribe is not a rational quest. The wisecrack video is easier to digest than the many books (for example Homo Deus, The Pinch, stupid white man ) on this subject, or the many articles from “the economist”, “der spiegel”, “de correspondent” etc. But the storyline is the same: the current world is complex and volatile and that creates the need for people to unite and religion is not there anymore to fulfill this role. The network society circle creating a gap in societies. It is my conclusion that extremism, populism, nationalism, burn-out and depression are the negative sides of the coin of the current open, transparent, fast-moving, highly innovative global village that is our world. This dark side of the coin is also called VUCA (Volatile, Uncertain, Complex, Ambiguous). 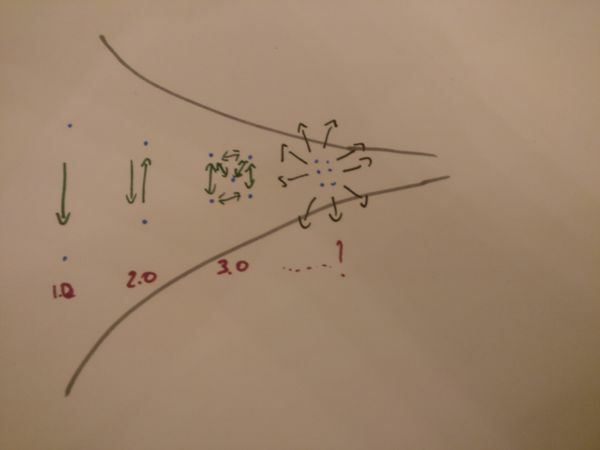 VUCA combined with the need for a tribe and a leader bring me to prediction 3. 2021 there will be a third world war. This is a more complex argumentation because WW3 would be the result of many developments. The need for an identity that is provided by a tribe also asks for a big and common enemy and a leader that unites against the enemy. Everywhere in the world (EU, US, Brazil, Venezuela, etc), people are gathering enmass behind populism and nationalism. Hate for others, blind following of a strong leader in a complex and unpredictable world are ingredients for an accident blowing stuff up and pull us into a new world war. When you listen to politic podcasts like “Talking Politics” (EN) or “Boekenstein & de Wijk” (NL) you will recognize the analysis. Most countries in the world are unstable (Venezuela, Brazil, Spain, Italy, France, USA, Germany, Hungary, Russia, Iran, Turkey, etc). Conflicts around Oil, Financial Markets, Climate etc are rising. The world is a big unstable atom, a heap of dry grass waiting for a spark to ignite it all. But not all is only dark. In everything, there is a dark side and a light side. So where there is a need for a strong leader that units on emotion as a tribe of people, there is also room for a leader that preaches love and enlightenment. 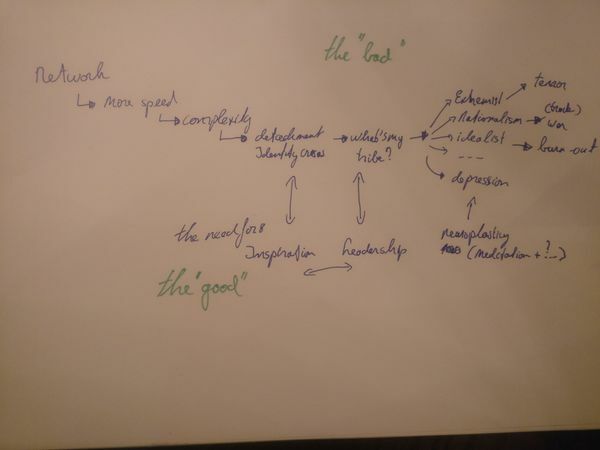 Summarizing the analysis of the dark side of the Network Society, and analysis of room for the good. This is where my hope is. We as a world will see a big crisis and a big war coming. And this pendulum will create room for our next enlightenment, the question only is.. Who is going to step up and direct the people of the whole world to our new future? History doesn’t repeat itself but it often rhymes. What we see is that various people that have a story of hope get big traction. Obama, Piketty, Harari, and in every country there are local versions of these preachers of hope. We only have to wait and see what event will unite us as inhabitants of the global village we call earth. Edzo Botjes is an Enterprise Engineer with more than 15+ years experience. His believe is that Enterprise Engineering covers not only Enterprise Architecture but also the skills needed to realistically implement innovation, governance and architecture. This implies that Group Psychology, IT Security Architecture, Technology Innovation and Ethics are a few topics that should be included into the developing strategy and architecture. Edzo is currently working on a Blockchain Reference Architecture and separately active as Principal Architect PKI. When talking about “Who is going to step up and direct the people of the whole world to our new future?” Have you followed this discussion? https://www.ft.com/content/44adcf46-2197-11e8-a895-1ba1f72c2c11 https://www.npostart.nl/vpro-tegenlicht/25-11-2018/VPWON_1284430 What do you think would be the impact of this potential change in capitalism? Hi.. I stumbled upon the FT paywall. do you have a topic discription (or something similar) to google on?